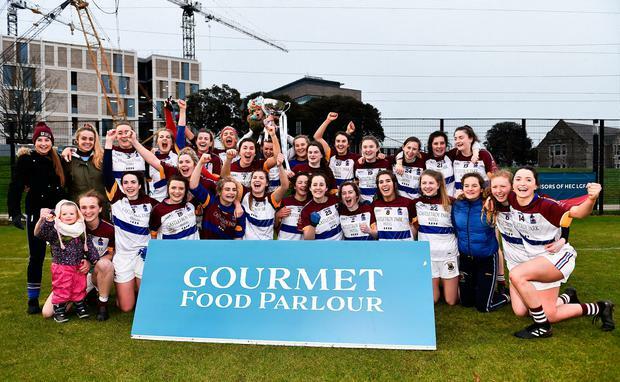 The Limerick college were totally dominant throughout the weekend's action and, after their 22-point triumph over Queens in the semi-final, they bossed league champions UCD in the decider. 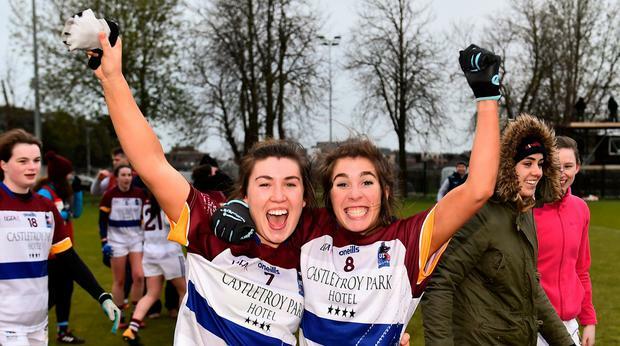 Cork forward Scally kicked seven points in Saturday's final at Grangegorman, while Fiona McHale and Hannah O'Donoghue fired the crucial goals. There was a late reply from Chloe Foxe for UCD, but it was a terrific UL defensive effort. "The main thing was work-rate and leadership. It was steady throughout," said Scally. 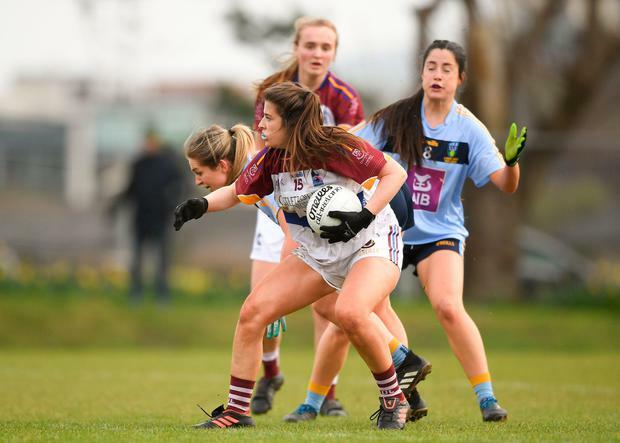 The windy conditions ensured UL had the advantage at the interval, but a 0-9 to 0-5 lead at that stage was unlikely to be enough. Instead of retreating into their defensive shells, UL stretched their lead in the second period, with the outstanding Laurie Ryan and Shauna Molloy driving them from defence. Meanwhile, UUJ are the Giles Cup champions after victory over WIT. Last year's Lynch Cup winners eased their way to the 2-17 to 1-9 win. 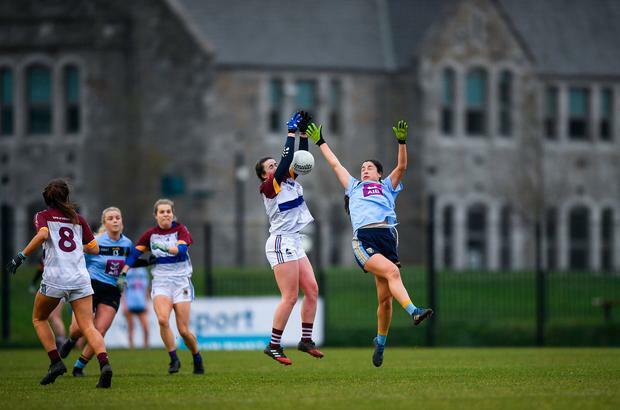 In the Lynch Cup, Technological University Dublin claimed victory over Garda College, 3-16 to 3-8. Scorers - UL: E Scally 0-7 (5f), H O'Donoghue 1-2, F McHale 1-0, R Delee, S Howley (1f) 0-2 each, F Tagney, E Needhan, O O'Dwyer 0-1 each. UCD: A McDonagh 0-6 (4f), C Foxe 1-0, C Mohan 0-2, K McGrath, D Beirne 0-1 each. UL - C Moore (Cork); S Molloy (Galway), C McGrath (Waterford), A Kelleher (Cork); L Ward (Galway), L Ryan (Clare), J Cregg (Roscommon); S Kelly (Cork), F McHale (Mayo); R Delee (Limerick), E Needham (Mayo), S Howley (Mayo); H O'Donoghue (Kerry), E Scally (Cork), R Howard (Tipperary). Subs: O O'Dwyer (Tipperary) for Needham (38), F Tagney (Kerry) for Howley (45), S Murphy (Kerry) for Molloy (48), A Healy (Laois) for Cregg (58), E Fitzpatrick (Tipperary) for Delee (58). UCD - L Bruggner (Kerry); K McGrath (Waterford), S Gormally (Galway), R Flynn (Mayo); N Carr (Donegal), N Collins (Dublin), M Byrne (Dublin); M Lambe (Dublin), T O'Sullivan (Dublin); A Murphy (Kerry), A McDonagh (Galway), L McCartan (Westmeath); C Mohan (Monaghan), D Beirne (Leitrim), K Boyce Jordan (Westmeath). Subs: C Foxe (Wexford) for McCartan (39), A O'Reilly (Kerry) for Beirne (50), S Fagan (Dublin) for O'Sullivan (53), K Maher (Kerry) for Carr (56). Ref - Seamus Mulvihill (Kerry).